Join one of our trustees, Hirsh, as he journeys through the Helambu Valley to visit our school construction projects. We have been working since the earthquakes in 2015 to re-build and re-construct 15 schools in the Valley. Up really early in order to be picked up by jeep outside entrance to the Boudha stupa – pity jeep doesn’t arrive until 50 minutes after planned start! Already within is Tom Wagner, American, specialist and advocate for greenhouses and passive solar buildings – he built his own house in California on these principles many years ago and funded greenhouses for farmers in our villages which regrettably were all destroyed by the earthquake. Also present is Yogi Kayastha of the Humla Development Initiative whom Tom is working with to build greenhouses in the Humla and Santos, an engineer from a local NGO that has special expertise in a building technique that we are introducing the use of rammed earth for the building walls. Along the way we pick up Chiring, our school rebuilding project manager, so with the driver we are now 6. The main purpose of our trip is to visit the two schools scheduled for rammed earth construction. Panchakanya and Gufa. 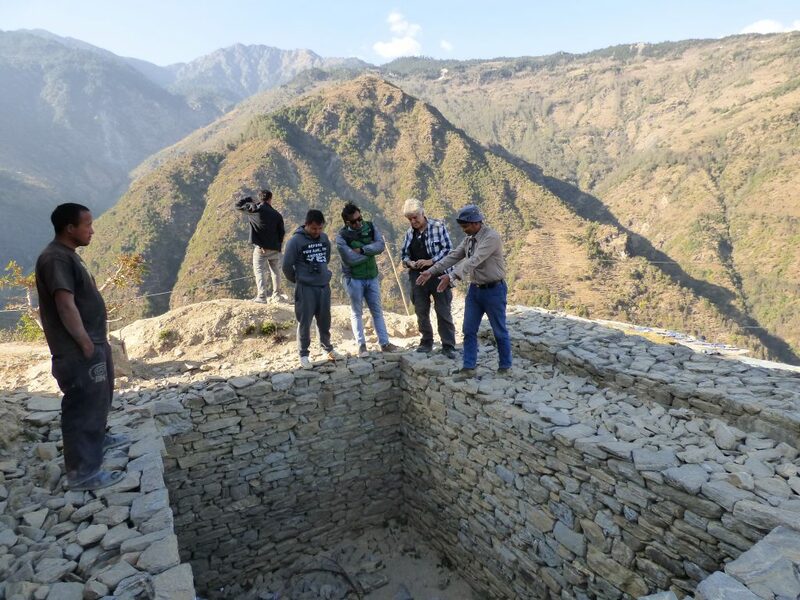 At Panchakanya we see the foundation work which is well underway and get to understand how the rammed earth walls will be constructed and fixed to the foundations. All is progressing well and receives Santos’ approval. 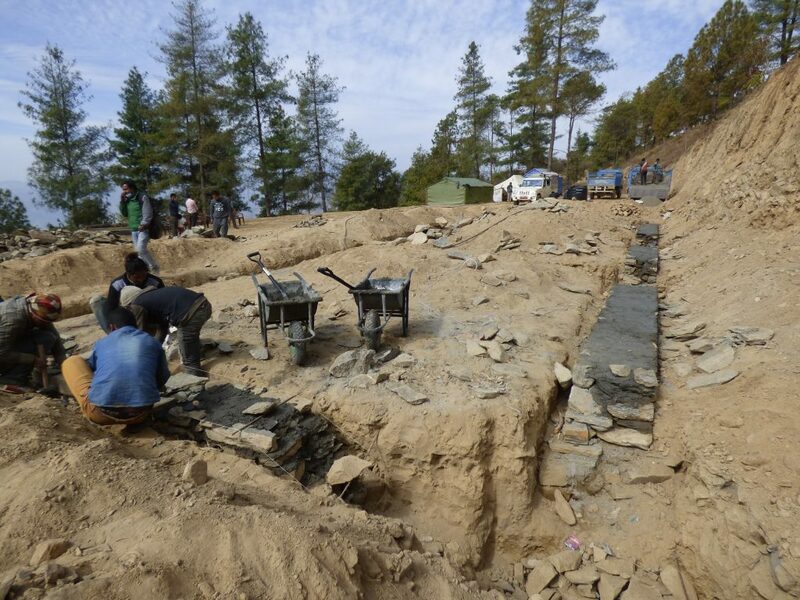 At Gufa the work is not yet started indeed our observations and discussions centre round which of several sites would be best – there are advantages and disadvantages to various options but there is space enough so the choice can be sensibly made. 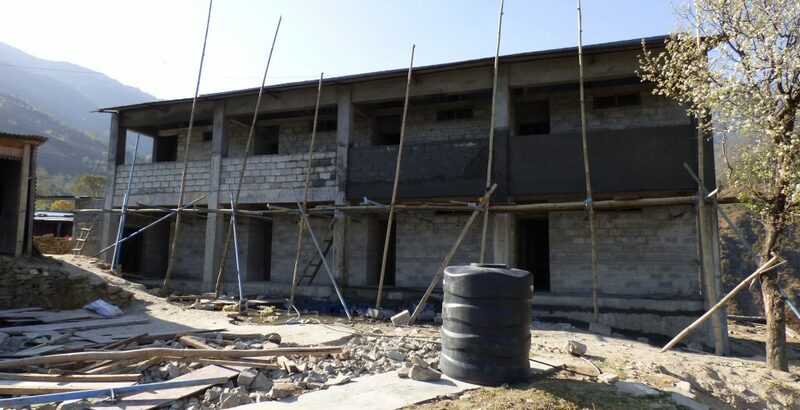 We then proceeed to Pading which has special interest for Tom as he has donated funds for some of the finishing works, notably plastering which is in process as we visit. The eight room two-storey building structure itself is complete as are the toilet block and cess pit. This is a poignant moment for me as I visited the site just six months after the earthquake in October 2015 and well remember the piles of rubble and one mostly devastated long building left standing as a skeleton with window frames dangling from the iron frame – it is still there and one part of it is in use as one of the temporary classrooms. And then to the long jeep journey back to Kathmandu. If the roads weren’t in such bad condition and we weren’t so squashed up together in a space really intended for 4 not six then driving 9 hours in a jeep (not counting any of the stops) to see these three schools would have been sheer delight. As it was, I arrive back at the hotel with serious backache and a resolve never again such a long journey in such cramped conditions. But I know in my heart I’ll do anything to see the schools!